Paarl Bird Sanctuary Counts in 2017. A working partnership with the Drakenstein Municipality and the Cape Bird Club. Monthly bird counts take place, on the last Saturday morning in the month. Anyone interested in helping can contact Yvonne Weiss at 021 872 4972 for details of starting time and meeting place. by John Fincham and Jo Hobbs. On the 02/12/2017 some Flamngos were back at PBS, including a single Lesser Flamingo. Deeper water in the pans, due to construction work, has not been to their liking though. There were also quite a lot of White-winged Terns, mainly on pan A. Report and photos by John Fincham. During the count at ​PBS this morning, there were African Snipe in the reeds that border the berm between pans E2 & E3. Also present were numerous Hottentot Teal on E2 and A pans, as well as White-faced Ducks with chicks. There was a flotilla of at least 70 Yellow-billled Duck on A pan early on. I have never seen so many. Red-billed Teal were also unusually numerous. A few White-winged Tern were around, mainly on B pan. John Fincham reported and supplied the photographs “There were several Ruff on pan E2 at Paarl Bird Sanctuary, this morning 30 October 2017″. See the layout of the pans. We had a bright sunny day at Paarl for the monthly count this morning 28/10/2017, and the birds put on an exceptional display. Whiskered Terns were detected in <25% of 120 counts, up to 2004. They have not been detected in 150 counts since then. Today there were at least 8 in breeding plumage on pan B. The Black-winged Stilts have got eggs, and a Glossy Ibis was spectacular. So were at least 8 Hottentot Teal on pan E2. The pans are deeper than usual because of increased flow due to alterations being made to the new concrete section. Some of the birds, including flamingos, have moved away because of this. The monthly CWAC count at PBS was on Saturday 26 August 2017. Emphatic evidence of spring was the prolific breeding by the gulls, both Grey-headed and Hartlaubs. This was reinforced by a male Pin-tailed whydah with an almost fully developed tail and a White-throated Swallow in striking plumage. A Fulvous Duck was amongst a group of White-faced Ducks, and the Water Dikkops (CRON) are always a pleasure. Report by John Fincham. 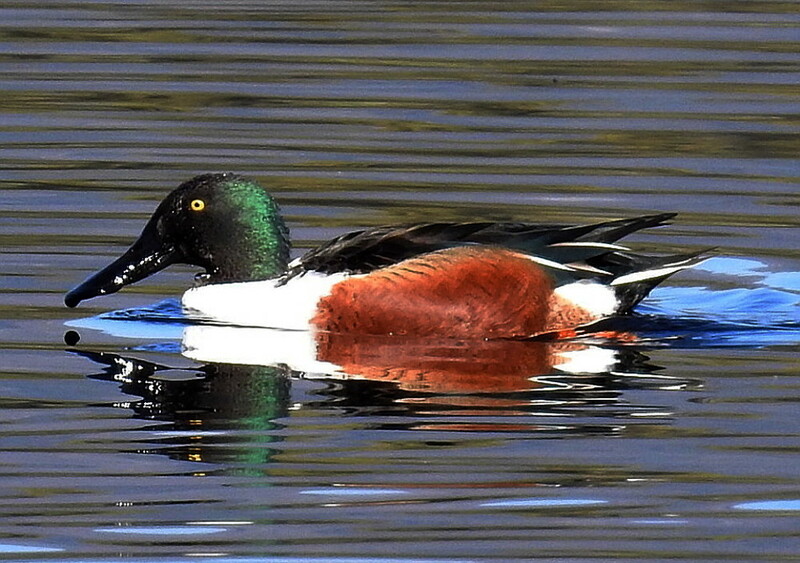 John Fincham reported on 21/05/2017 the photos show a Northern Shoveler drake in breeding plumage. It was on C pan at PBS this morning, accompanied by Cape Shovelers. It may, or may not be, an escapee. Other specials were Fulvous Duck, Hottentot Teal, White-faced Duck, African Snipe and Southern Pochard. John Fincham reports on 24/06/2017 that there were 19 White faced Ducks in the group photo. Also seen was this Lesser Swamp Warbler. There were Hottentot teal present too. These were some of the common birds seen today at the count.